It should come as no surprise to restaurant owners and operators that cleanliness is a key factor for a successful business. 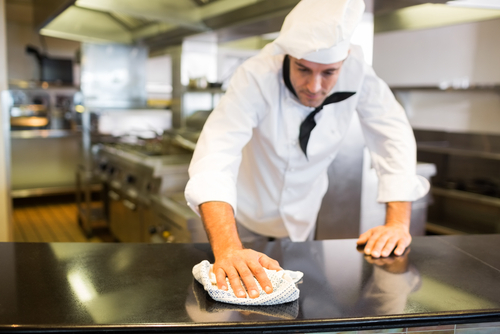 In addition to obtaining New York Restaurant Insurance, these proper cleaning practices can ensure your facility stays in top shape and continues to thrive. Stop Dirt at the Door- According to Cintas Corporation, 42 percent of people look at the floors first when determining the cleanliness of a restaurant. As such, floor mats and rugs at the entrance can help to keep outside dirt from tracking through your facility. Especially during wet seasons, floors should be regularly cleaned and maintained to avoid soil buildup in grout. Restroom Maintenance- Cintas also reported that the key indicators of patron dissatisfaction in bathrooms resulted from dirty facilities with 84 percent citing empty toilet paper dispensers, 76 percent with empty soap containers, and 83 percent citing wet surfaces. Regular attention should be paid to restrooms, having your staff maintain them every 30 minutes. In addition, deep cleaning surfaces at least once a week can help to minimize any build up or odors, as well. Keep the Kitchen Clean- As approximately 40 percent of food poisoning cases stem from poor hand washing and cross-contamination, proper sanitation practices are essential. Disinfectants, sanitizers, and food organization can help minimize food borne illnesses. Further, proper drain line maintenance can reduce the risk of exposure to harmful bacteria. Clean Dining Areas- Color coordinating cleaning tools to separate supplies used for restrooms and dining areas can help to ensure patron satisfaction and safety. Microfiber towels can absorb bacteria and dirt from tables, menus, pedestals, and condiment holders. Ongoing Training- Each new employee should be informed on proper cleaning practices to avoid foodborne illness, cross contamination, and bacterial infection. If language barriers exist, employ a color coordinated cleaning system to avoid any confusion and provide manuals and instructions clearly in the employee area. What’s more, the FDA stated that the presence of a food protection manager resulted in significantly higher compliance levels with food safety practices. If possible, employing these staff can help to improve food safety practices to reduce safety risks. At RMS Hospitality Group, we strive to protect the broad scope of risks restaurants like yours face on a daily basis. We understand the implications of each exposure which is why we offer comprehensive coverage at competitive rates. For more information on our products and services, contact us today at (888) 359-8390.